Looking for fantasy parody game play testers! If you’ve followed my work for a while you might be aware of the game I’ve been working on as a personal project: Hero Master Critical Fails! I started the project about three years ago with an idea, then released a series of greetings cards in the art style in which I wanted to create the game. They have proven really popular and I sell them still today. While I was quite vocal about the game to start with, I began to get deeper into it, and realised how much work there was ahead. I went radio silent for a while, rejigging the mechanics and polishing the game experience with a few friends. 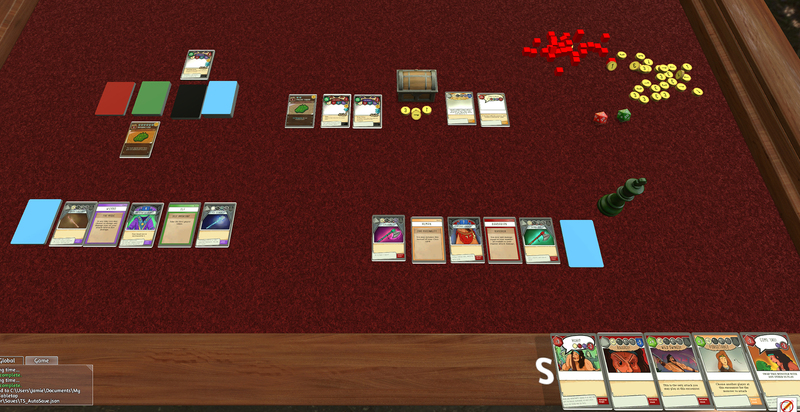 Now it’s really taken shape, I’m really looking for play testers who own either Tabletop Simulator (preferably, where the game is already up and running) or Tabletopia which I’ve yet to use. You take the role of one of four heroes, with their own individual strengths and weaknesses, on a quest to earn the most gold they can. Crackletooth the Tepid, the terrifying dragon had made his nest in the mountains above Snoozeshire once more. Heroes from all around the shires had been flocking to the Guzzletankard Tavern to prepare to defeat the dragon all week, clubbing together into adventure parties and setting off. Each of them hoping to bring back tales of bravery and more importantly the biggest sack of gold they could get their mitts on. Brian the Barbarian was one such a hero and so was Dongleflop the wizard, Roy the Rogue and Linda the Cleric. None of them knew exactly why they hadn’t been picked for a party; in fairness Brian hadn’t really noticed the tavern empty and Roy was too busy pilfering Brian’s purse. Linda had been trying to justify a tithe on the ale barrel, so it was left to Dongleflop. Who was, as usual, outraged at the situation. Maybe it was their inexperience, unfortunate reputation, or the fact that each had tripped over the same step as they’d walked in to the tavern that left them all alone in the stale, dark drinking hall. Having tried to lose them several times in search of a better set of companions, Dongleflop decided to accept defeat for another adventure with the bold reassurance from Linda that they’d “probably be ok”. With Brian introducing himself to each of them for a ninth time this week, the hapless adventurers gathered themselves and set out to seek their fortune. The turn order begins with the Party Leader who, as you can imagine in a group of inept heroes like this, is usurped very often! 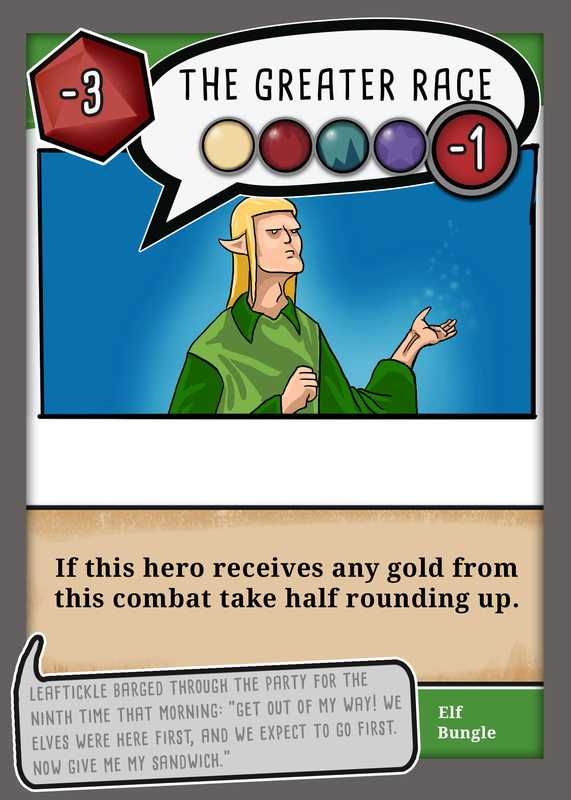 The party leader draws two location cards, and chooses the direction in which the party will head. The location card will show what loot is available and what monsters are guarding it. It will often also have a special rule which will affect that area. Once the area is set up, the Party Leader chooses an enemy to attack by laying an attack card. Play now moves around clockwise, with players laying they’re own attack, declining the encounter or playing a ‘bungle’ card. Bungle cards are your heroes quirky negative traits, which unbeknownst to them are often their saving glory. 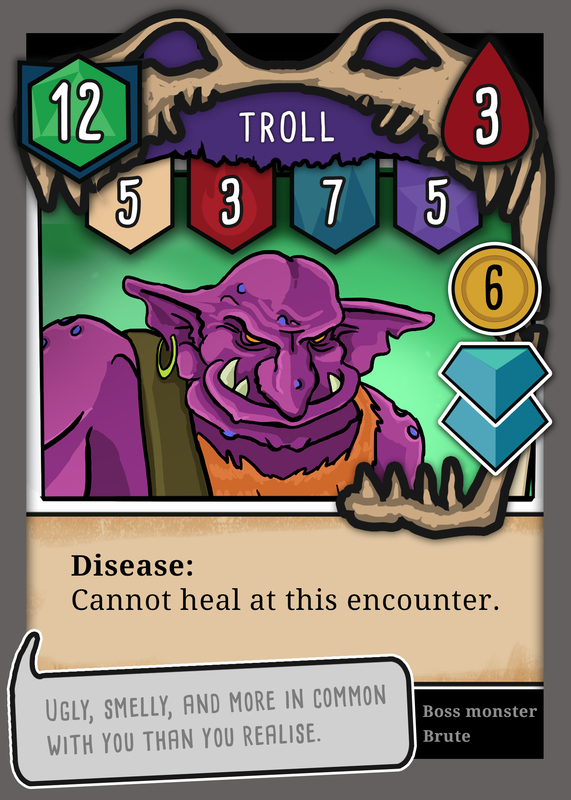 Bungle cards are played onto another hero’s attack, to scupper their chances of success by reducing damage and their chance to hit. Watch out though, if you bungle someones attack and the result after the effect is a roll of a one… Boom! A Critical Fail occurs. You don’t want to be around one someone with an axe is swinging and misses in the worst way possible. If you do manage to beat the monsters, there is loot to be had. 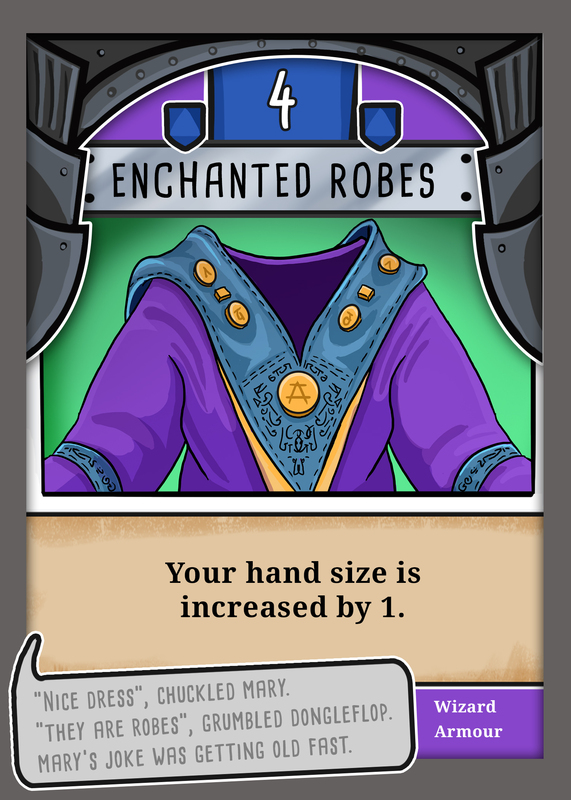 Treasure cards to update your permanent cards and your deck, and gold to prove how great an adventurer you are! So it’s a game of push your luck, deck building, and “take that” mechanics, while also using cards strategically and outwitting your witless party! Next Post:Sale! All my products on Amazon are on sale for a short time.